Prehistory is the time before written records. For the Aleuts that would be the time before the Russians appeared in the middle of the 18th century. Trying to determine the prehistory of the Aleuts is not simple, not because nobody has tried to discover it but rather because much of the land that people occupied during the migration from Asia to America is now under water. In any case, I will share what I have found. Language analysis suggests that Eskimos and Aleuts both shared a common language at one time which in turn suggests that they shared a single culture in the past and probably the same group of ancestors. Genetic evidence suggests that the group ancestral to both Eskimos and Aleuts crossed over to America roughly 15,000 years ago during the early post-glacial period and took refuge in what is now southern Alaska. From there, the ancestors of today's Eskimos and Aleuts migrated north to populate their present-day territories. An earlier theory had the Eskimo-Aleut ancestors migrating to America from the Siberian interior roughly 6000 years ago. The pink/orange area is the extent of glacier-free land during the last ice age. It is here in ice-free Alaska that the ancestors of the Eskimos and Aleuts migrated to and that they dispersed from later to settle the Aleutians and the Arctic coast of North America. The earliest evidence of human habitation in the Aleutians was found on the island of Anangula off the coast of Umnak island in the eastern Aleutians. The site was dated 8500 BP (before the present). Occupation of the settlement was ended by a nearby volcanic eruption that covered the island in six feet of volcanic ash. There is some dispute whether this settlement was peopled by ancestors of present day Aleuts or whether it was peopled by a group that was not a cultural ancestor of the Aleuts. In any case, whoever settled Anangula had boats because Anangula was an island even 8500 BP. Other archaeological evidence places Aleuts in the eastern Aleutians about 4000 years ago and in the western Aleutians 2000 years ago. Migration was clearly east to west from the direction of the Alaskan Peninsula and not west to east from Kamchatka. 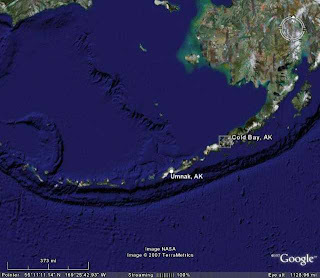 The island of Anangula is about a mile from Umnak which is in the center of this map. Also extending upward from Umnak you can see the edge of what is the shallow part of the Bering Sea which during the last ice age was above water and formed part of Beringia. Regardless of which direction the Aleuts came from and regardless of when they first arrived in the Aleutians, they must have made the migration by boat. Nobody knows what kinds of boats the Aleuts used to settle the Aleutians. Did they have open boats and closed deck kayaks when they started the migration or did they only have open boats and invented the kayaks later? This post and the prior one are all good stuff. Thank you for sharing it. I'm still looking forward to your your new book.